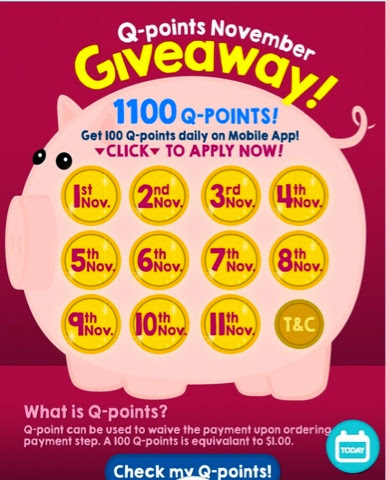 Only applicable on Mobile App, qoo10 is giving 100 points a day when you click on the dates. Total 1100 up for grabs, that's $11 worth of credits on qoo10. Mdm Cheapo loves qoo10! I think they are gearing up for the Xmas shopping! Just an additional info, this is mobile specific & not account specific. If you use the same mobile and log in different accounts, they will only credit into 1 account. Well, have fun shopping with the $11! 1. maximum up to 30% of the total purchase amount is able waive off by Qpoint, minimum required Qpoint is 100 up to 1000 points. 2. Qpoint application is base on 100 points per unit. (100 Qpoints equivalent for S$1.00). 3. Usable Qpoint: the Qpoint must be obtained from purchase which has marked as delivered for more than 7 days.